This article is about the Ming Dynasty Emperor. For the Western Xia Emperor who also used an era name called Zhengde, see Emperor Chongzong of Western Xia. This article is about the Ming Dynasty Emperor. For the Liang Emperor who also used Zhengde as his personal name, see Xiao Zhengde. The Zhengde Emperor (Chinese: 正德帝; pinyin: Zhèngdé Dì; 27 October 1491 – 20 April 1521) was the 11th emperor of the Ming dynasty between 1505 and 1521. Born Zhu Houzhao, he was the Hongzhi Emperor's eldest son. Zhu Houzhao took the throne at only 14 with the era name Zhengde meaning "Right virtue" or "Rectification of virtue". He was known for favoring eunuchs such as Liu Jin and became infamous for his childlike behavior eventually dying from a illness he contracted after falling off while drunk in a boat in the Yellow River at the age of 29 leaving behind no sons and was succeeded by his first cousin Zhu Houcong. Zhu Houzhao was created crown prince at a very early age and because his father did not take up any other concubines, Zhu did not have to contend with other princes for the throne. (His younger brother died in infancy.) The prince was thoroughly educated in Confucian literature and he excelled in his studies. Many of the Hongzhi Emperor's ministers expected that Zhu Houzhao would become a benevolent and brilliant emperor like his father. Zhu Houzhao ascended the throne as the Zhengde Emperor and was married to his Empress at the age of 14. Unlike his father, the Zhengde Emperor was not interested in ruling or his Empress and disregarded most state affairs. His actions have been considered reckless, foolish or pointless. There are many instances where he showed a lack of responsibility. The Zhengde Emperor took up a luxurious and prodigal lifestyle and indulged himself in women. It was said that he liked to frequent brothels and even created palaces called "Bao Fang" (豹房; literally "The Leopards' Chamber") outside the Forbidden City in Beijing initially to house exotic animals such as tigers and leopards for his amusement and then later used to house beautiful women for his personal enjoyment. On one occasion he was badly mauled while hunting tigers, and could not appear in court audiences for a month. On another occasion he burned down his palace by storing gunpowder in the courtyards during the lantern festival. His harem was so overfilled that many of its women starved to death due to lack of supplies. Zhu Houzhao was noted by many sources as fairly efficient administrator, although indulging in an luxurious life style and refusing to attend most meetings, he showed himself to be competent in his decisions and governance. Under his rule, the economy continued to grow, and the people were generally prosperous. For months at a time he would live outside the Forbidden City or travel around the country with heavy expenditures being paid from the Ming government's coffers. While being urged to return to the palace and attend to governmental matters, the Zhengde Emperor would refuse to receive all his ministers and ignored all their petitions. He also sanctioned the rise of eunuchs around him. One particular Liu Jin, leader of the Eight Tigers, was notorious for taking advantage of the young emperor and squandered immense amount of silver and valuables. The diverted funds were about 36 million pounds of gold and silver. There was even rumor of a plot that Liu Jin had intended to murder the emperor and place his own grandnephew on the throne. Liu Jin's plot was ultimately discovered, and he was executed in 1510. However, the rise of corrupt enunchs continued throughout the Zhengde Emperor's reign. There was also an uprising led by the Prince of Anhua and another uprising led by the Prince of Ning. The Prince of Anhua was the Zhengde Emperor's great-granduncle, while the Prince of Ning was his granduncle. In time, the Zhengde Emperor became notorious for his childish behaviour as well as abusing his power as emperor. For instance, he set up a staged commercial district inside his palace and ordered all his ministers, eunuchs, soldiers and servants of the palace to dress up and act as merchants or street vendors while he walked through the scene pretending to be a commoner. Any unwilling participants, especially the ministers (who viewed it as degrading and an insult), would be punished or removed from their post. Then in 1517, the Zhengde Emperor gave himself an alter ego named Zhu Shou (朱壽) so he could relinquish his imperial duties and send himself off on an expedition to the north to repel raiding expeditions several tens of thousands strong led by Dayan Khan. He met the enemy outside the city of Yingzhou and defeated them in a major battle by surrounding them. For a long period of time after this battle, the Mongols did not launch a raiding expedition into Ming territory. Then again in 1519, the Zhengde Emperor led another expedition to Jiangxi province to the south to quell the Prince of Ning rebellion by a powerful prince known as Zhu Chenhao who had bribed many people in the emperor's cabinet. He arrived only to discover that the revolt had already been put down by Wang Yangming, a local administrative officer. Frustrated at not being able to lead his troops to victory, the Zhengde Emperor's advisor suggested they release the prince in order to capture him again. In January 1521, the Zhengde Emperor had the rebel Prince of Ning executed in Tongzhou, an event that was recorded even by the Portuguese embassy to China. The Zhengde Emperor was fascinated by foreigners and invited many Muslims to serve as advisors, eunuchs, and envoys at his court. Works of art such as porcelain from his court contained Islamic inscriptions in Arabic or Persian. An anti pig slaughter edict led to speculation that the Zhengde emperor adopted Islam due to his use of Muslim eunuchs who commissioned the production of porcelain with Persian and Arabic inscriptions in white and blue. It is unknown who really was behind the anti-pig slaughter edict. The Zhengde Emperor preferred foreign Muslim women, having many relationships with them. According to Bret Hinsch in the book Passions of the cut sleeve: the male homosexual tradition in China, the Zhengde Emperor had an alleged homosexual relationship with a Muslim leader from Hami, named Sayyid Husain, who served as the overseer in Hami during the Ming-Turpan border wars, although no evidence supporting this claim exists in Chinese sources. Prior to the death of the Zhengde Emperor in early 1521, rumours about a mysterious group of creatures collectively called Dark Afflictions (Chinese: 黑眚; pinyin: Hēi Shěng) circulated the capital. Their attacks caused much unrest, because they randomly attacked people at night, causing wounds with their claws. The Minister for War asked the emperor to write an imperial edict proclaiming local security troops would arrest all those who frightened other people. The threat brought a sudden end to the spread of the stories. — Samuel Wells Williams, The Middle Kingdom: A Survey of the Geography, Government, Education, Social Life, Arts, Religion, &c. of the Chinese Empire and Its Inhabitants, 2 vol. (Wiley & Putnam, 1848). 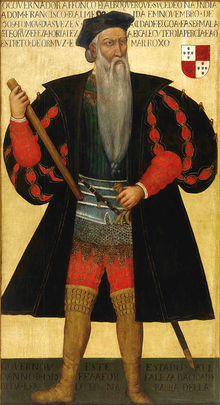 Afonso de Albuquerque, who commissioned the first direct European maritime ventures to China from Portuguese Malacca. The first direct European contacts with China occurred during the reign of the Zhengde Emperor. In several initial missions commissioned by Afonso de Albuquerque of Portuguese Malacca, the Portuguese explorers Jorge Álvares and Rafael Perestrello landed in southern China and traded with the Chinese merchants of Tuen Mun and Guangzhou. In 1513 their king, Manuel I of Portugal sent Fernão Pires de Andrade and Tomé Pires to formally open relations between the main court at Beijing and Lisbon, capital of Portugal. Although the Zhengde Emperor gave the Portuguese embassy his blessing while touring Nanjing in May 1520, he died soon after and the Portuguese (who were rumored to be troublemakers in Canton and even cannibals of kidnapped Chinese children), were ejected by Chinese authorities under the new Grand Secretary Yang Tinghe. Although illegal trade continued thereafter, official relations between the Portuguese and the Ming court would not improve until the 1540s, culminating in the Ming court's consent in 1557 which allowed Portugal to establish Macau as their trading base in China. The Malay Malacca Sultanate was a tributary state and ally to Ming China. When Portugal conquered Malacca in 1511 and committed atrocities against the Malay Sultanate, the Chinese responded with violent force against Portugal. The Ming government imprisoned and executed multiple Portuguese envoys after torturing them in Guangzhou. The Malaccans had informed the Chinese of the Portuguese seizure of Malacca, to which the Chinese responded with hostility toward the Portuguese. The Malaccans told the Chinese of the deception the Portuguese used, disguising plans for conquering territory as mere trading activities, and told of all the atrocities committed by the Portuguese. Due to the Malaccan Sultan lodging a complaint against the Portuguese invasion to the Zhengde Emperor, the Portuguese were greeted with hostility from the Chinese when they arrived in China. The Malaccan Sultan, based in Bintan after fleeing Malacca, sent a message to the Chinese, which combined with Portuguese banditry and violent activity in China, led the Chinese authorities to execute 23 Portuguese and torture the rest of them in jails. After the Portuguese set up posts for trading in China and committed piratical activities and raids in China, the Chinese responded with the complete extermination of the Portuguese in Ningbo and Quanzhou Pires, a Portuguese trade envoy, was among those who died in the Chinese dungeons. The Chinese defeated a Portuguese fleet in 1521 at the Battle of Tunmen , killing and capturing so many Portuguese that the Portuguese had to abandon their junks and retreat with only three ships, only escaping back to Malacca because a wind scattered the Chinese ships as the Chinese launched a final attack. The Chinese effectively held the Portuguese embassy hostage, using them as a bargaining chip in demanding that the Portuguese restore the deposed Malaccan Sultan (King) to his throne. The Chinese proceeded to execute several Portuguese by beating and strangling them, and torturing the rest. The other Portuguese prisoners were put into iron chains and kept in prison. The Chinese confiscated all of the Portuguese property and goods in the Pires embassy's possession. In 1522 Martim Afonso de Merlo Coutinho was appointed commander of another Portuguese fleet sent to establish diplomatic relations. The Chinese defeated the Portuguese ships led by Coutinho at the Battle of Shancaowan. A large amount of Portuguese were captured and ships destroyed during the battle. The Portuguese were forced to retreat to Malacca. The Chinese forced Pires to write letters for them, demanding that the Portuguese restore the deposed Malaccan Sultahn (King) back onto his throne. The Malay ambassador to China was to deliver the letter. The Chinese had sent a message to the deposed Sultan (King) of Malacca concerning the fate of the Portuguese embassy, which the Chinese held prisoner. When they received his reply, the Chinese officials then proceeded to execute the Portuguese embassy, slicing their bodies into multiple pieces. Their genitalia were inserted into the oral cavity. The Portuguese were executed in public in multiple areas in Guangzhou, deliberately by the Chinese in order to show that the Portuguese were insignificant in the eyes of the Chinese. When more Portuguese ships landed and were seized by the Chinese, the Chinese then executed them as well, cutting off the genitalia and beheading the bodies and forcing their fellow Portuguese to wear the body parts, while the Chinese celebrated with music. The genitalia and heads were displayed strung up for display in public, after which they were discarded. The Zhengde Emperor died in 1521 at the age of 31. It was said that he was drunk while boating on a lake one day in the fall of 1520. He fell off his boat and almost drowned. He died after contracting illnesses from the Grand Canal waters. Since none of his several children had survived childhood, he was succeeded by his cousin Zhu Houcong, who became known as the Jiajing Emperor. His tomb is located at Kangling of the Ming tombs. By the accounts of some historians[by whom? ], although bred to be a successful ruler, the Zhengde Emperor thoroughly neglected his duties, beginning a dangerous trend that would plague future Ming emperors. The abandonment of official duties to pursue personal gratification would slowly lead to the rise of powerful eunuchs that would dominate and eventually ruin the Ming dynasty. The Ming scholar Tan Qian argued that: "The Emperor was smart and playful... He also did not harm officials who argued against him. [He enjoyed] the support of the minister and the efficient works of the clerks. [He worked until] midnight to issue edicts that punished [the criminals] like Liu Jin and Qian Ning (Zhengde's own adoptive son)." Some modern historians[who?] have come to view his reign in a new light and debate that his actions along with that of his successors such as the Wanli Emperor were a direct reaction to the bureaucratic gridlock that affected the Ming dynasty in its later half. The emperors were very limited in their policy decision and could not really implement any sort of lasting effective reforms despite the obvious need, while they were faced with constant pressure and were expected to be responsible for all the troubles the dynasty faced. As a result, the ministers became increasingly frustrated and disillusioned about their posts, and protested in different forms of what was essentially an imperial strike. Thus emperors such as the Zhengde Emperor sneaked out of the palace while emperors such as the Jiajing and Wanli emperors simply did not show up in the imperial court. Other authors  state that Zhengde was a ruler with a strong will, who dealt decisively with Liu Jin, Prince Ning, Prince Anhua and the Mongol threat, acted competently in crises caused by natural disasters and plagues and collected taxes in a benevolent manner. Although his reign's achievements were in large parts the contributions of his very talented officials, they also reflected on the capability of the ruler. In the 1959 film Kingdom and the Beauty (江山美人), the Zhengde Emperor disguises himself as a regular commoner among the people. The film Chinese Odyssey 2002 was loosely based on a story of one of the Zhengde Emperor's tours in Zhejiang province. In the 2005 television show Zhengde Commentary (正德演義), the Zhengde Emperor was portrayed by television variety show host He Jiong. ^ Timothy Brook (2010). The Troubled Empire: China in the Yuan and Ming Dynasties. Harvard University Press. p. 98. ISBN 978-0-674-04602-3. ^ a b c Chase, Kenneth Warren. (2003). Firearms: A Global History to 1700. Cambridge University Press. ISBN 0-521-82274-2. p 159. ^ Ellen Widmer; Kang-i Sun Chang (1997). Writing women in late imperial China. Stanford University Press. p. 239. ISBN 978-0-8047-2872-0. ^ a b Wintle, Justin. Guides, Rough. (2002). China. ISBN 1-85828-764-2. p 244-245. ^ Julia Ching (1993). Chinese religions. Macmillan. ISBN 978-0-333-53174-7. ^ Bret Hinsch (1992). Passions of the cut sleeve: the male homosexual tradition in China. University of California Press. p. 142. ISBN 978-0-520-07869-7. ^ Société française des seiziémistes (1997). Nouvelle revue du XVIe siècle, Volumes 15–16. Droz. p. 14. ^ B. J. ter Haar. Translated by Zakeri, Mohsen. (2005). Telling Stories: Witchcraft And Scapegoating in Chinese History. ISBN 90-04-13160-4. ^ Ahmad Ibrahim; Sharon Siddique; Yasmin Hussain, eds. (1985). Readings on Islam in Southeast Asia. Institute of Southeast Asian Studies. p. 11. ISBN 978-9971-988-08-1. in China was far from friendly; this, it seems, had something to do with the complaint which the ruler of Malacca, conquered by the Portuguese in 1511, had lodged with the Chinese emperor, his suzerain. ^ Koninklijk Instituut voor Taal-, Land- en Volkenkunde (Netherlands) (1968). Bijdragen tot de taal-, land- en volkenkunde, Part 124. M. Nijhoff. p. 446. The reception in China was far from friendly; this, it seems, had something to do with the complaint which the ruler of Malacca, conquered by the Portuguese in 1511, had lodged with the Chinese emperor, his suzerain. ^ Bijdragen tot de taal-, land- en volkenkunde, Volume 124. 1968. p. 446. The reception in China was far from friendly; this, it seems, had something to do with the complaint which the ruler of Malacca, conquered by the Portuguese in 1511, had lodged with the Chinese emperor, his suzerain. ^ Alijah Gordon, Malaysian Sociological Research Institute (2001). The propagation of Islam in the Indonesian-Malay archipelago. Malaysian Sociological Research Institute. p. 136. ISBN 978-983-99866-2-4. His reception in China was far from friendly; this, it seems, had something to do with the complaint which the ruler of Melaka, conquered by the Portuguese in 1511, had lodged with the Chinese emperor, his suzerain. ^ John William Parry (1969). Spices: The story of spices. The spices described. Volume 1 of Spices. Chemical Pub. Co. p. 102. Fernao Pires de Andrade reached Peking, China, in 1520, but unfortunately for that Portuguese envoy, he was treated as a spy and died in a Cantonese prison. ^ Tomé Pires; Armando Cortesão; Francisco Rodrigues (1990). Armando Cortesão, ed. The Suma oriental of Tome Pires: an account of the East, from the Red Sea to China, written in Malacca and India in 1512-1515 ; and, The book of Francisco Rodrigues : Pilot-Major of the armada that discovered Banda and the Moluccas : rutter of a voyage in the red sea, nautical rules, almanack ... Volume 1 of The Suma Oriental of Tome Pires: An Account of the East, from the Red Sea to Japan, Written in Malacca and India in 1512-1515, and The Book of Francisco Rodrigues, Rutter of a Voyage in the Red Sea, Nautical Rules, Almanack and Maps, Written and Drawn in the East Before 1515 (illustrated, reprint ed.). Asian Educational Services. p. xl. ISBN 978-81-206-0535-0. Retrieved 14 December 2011. In the meantime, after the departure of Simão de Andrade, the ship Madalena, which belonged to D. Nuno Manuel, coming from Lisbon under the command of Diogo Calvo, arrived at Tamão with some other vessels from Malacca, among them the junk of Jorge Álvares, which the year before could not sail with Simão de Andrade's fleet, because she had sprung a leak. .., the Chinese seized Vasco Calvo, a brother of Diogo Calvo, and other Portuguese who were in Canton trading ashore. On 27 June 1521 Duarte Coelho arrived with two junks at Tamão. Besides capturing some of the Portuguese vessels, the Chinese blockaded Diogo Calvo's ship and four other Portuguese vessels in Tamão with a large fleet of armed junks. A few weeks later Ambrósio do Rego arrived with two other ships. As many of the Portuguese crews had been killed in the fighting, slaughtered afterwards or taken prisoners, by this time there was not enough Portuguese for all the vessels, and thus Calvo, Coelho, and Rego resolved to abandon the junks in order the batteter to man the three ships. They set sail on 7 September and were attacked by the Chinese fleet, managing however to escape, thanks to a providential gale which scattered the enemy junks, and arrived at Malacca in October 1521. Vieira mentions other junks which arrived in China with Portuguese aboard; all were attacked, and the entire crews were killed fighting or were taken prisoners and slaughtered later. ^ Tomé Pires; Armando Cortesão; Francisco Rodrigues (1990). Armando Cortesão, ed. The Suma oriental of Tome Pires: an account of the East, from the Red Sea to China, written in Malacca and India in 1512-1515 ; and, The book of Francisco Rodrigues : Pilot-Major of the armada that discovered Banda and the Moluccas : rutter of a voyage in the red sea, nautical rules, almanack ... Volume 1 of The Suma Oriental of Tome Pires: An Account of the East, from the Red Sea to Japan, Written in Malacca and India in 1512-1515, and The Book of Francisco Rodrigues, Rutter of a Voyage in the Red Sea, Nautical Rules, Almanack and Maps, Written and Drawn in the East Before 1515 (illustrated, reprint ed.). Asian Educational Services. p. xl. ISBN 978-81-206-0535-0. Retrieved 14 December 2011. Finally Pires and his companions left Peking on 22 May and arrived in Canton on 22 Sept. 1521. Francisco de Budoia died during the journey. From Peking instructions were sent to Canton that the ambassador and his suite should be kept in custody, and that only after the Portuguese had evacuated Malacca and returned it to its king, a vassal of the Emperor of China, would the members of the embassy be liberated. ^ Tomé Pires; Armando Cortesão; Francisco Rodrigues (1990). Armando Cortesão, ed. The Suma oriental of Tome Pires: an account of the East, from the Red Sea to China, written in Malacca and India in 1512-1515 ; and, The book of Francisco Rodrigues : Pilot-Major of the armada that discovered Banda and the Moluccas : rutter of a voyage in the red sea, nautical rules, almanack ... Volume 1 of The Suma Oriental of Tome Pires: An Account of the East, from the Red Sea to Japan, Written in Malacca and India in 1512-1515, and The Book of Francisco Rodrigues, Rutter of a Voyage in the Red Sea, Nautical Rules, Almanack and Maps, Written and Drawn in the East Before 1515 (illustrated, reprint ed.). Asian Educational Services. p. xlii. ISBN 978-81-206-0535-0. Retrieved 14 December 2011. Meanwhile from India, where the news of this state of affairs had not yet arrived, another fleet of four ships under the command of Martim Afonso de Merlo Coutinho sailed for China in April 1522. Countinho had left Lisbon just one year before, commimssioned by Dom Manuel with a message of good-will to the Emperor of China, for which purpose he carried another ambassador with him. ^ Tomé Pires; Armando Cortesão; Francisco Rodrigues (1990). Armando Cortesão, ed. The Suma oriental of Tome Pires: an account of the East, from the Red Sea to China, written in Malacca and India in 1512-1515 ; and, The book of Francisco Rodrigues : Pilot-Major of the armada that discovered Banda and the Moluccas : rutter of a voyage in the red sea, nautical rules, almanack ... Volume 1 of The Suma Oriental of Tome Pires: An Account of the East, from the Red Sea to Japan, Written in Malacca and India in 1512-1515, and The Book of Francisco Rodrigues, Rutter of a Voyage in the Red Sea, Nautical Rules, Almanack and Maps, Written and Drawn in the East Before 1515 (illustrated, reprint ed.). Asian Educational Services. p. xliii. ISBN 978-81-206-0535-0. Retrieved 14 December 2011. Coutinho's fleet of six sail left Malacca on 10 July and arrived at Tamão in August 1522. They were sson attacked by the Chinese fleet. The Portuguese had many men killed and taken prisoners, two ships and the junk were lost, and after vain efforts to re-establish relations with the Cantonese authorities, Coutinho returned with the other ships to Malacca, where he arrived in the middle of October 1522. Though some chroniclers put the blame on the Chinese, Chang quotes Chinese sources which assert that the Portuguese should be held responsible for the outbreak of hostilities. ^ Tomé Pires; Armando Cortesão; Francisco Rodrigues (1990). Armando Cortesão, ed. The Suma oriental of Tome Pires: an account of the East, from the Red Sea to China, written in Malacca and India in 1512-1515 ; and, The book of Francisco Rodrigues : Pilot-Major of the armada that discovered Banda and the Moluccas : rutter of a voyage in the red sea, nautical rules, almanack ... Volume 1 of The Suma Oriental of Tome Pires: An Account of the East, from the Red Sea to Japan, Written in Malacca and India in 1512-1515, and The Book of Francisco Rodrigues, Rutter of a Voyage in the Red Sea, Nautical Rules, Almanack and Maps, Written and Drawn in the East Before 1515 (illustrated, reprint ed.). Asian Educational Services. p. xlvi. ISBN 978-81-206-0535-0. Retrieved 14 December 2011. On fol. 108v. it is stated that Martim Afonso de Melo Coutinho went from Malacca to China in 1521, but in fol. 121 it is correctly said that he arrived in 1522. ^ Tomé Pires; Armando Cortesão; Francisco Rodrigues (1990). Armando Cortesão, ed. The Suma oriental of Tome Pires: an account of the East, from the Red Sea to China, written in Malacca and India in 1512-1515 ; and, The book of Francisco Rodrigues : Pilot-Major of the armada that discovered Banda and the Moluccas : rutter of a voyage in the red sea, nautical rules, almanack ... Volume 1 of The Suma Oriental of Tome Pires: An Account of the East, from the Red Sea to Japan, Written in Malacca and India in 1512-1515, and The Book of Francisco Rodrigues, Rutter of a Voyage in the Red Sea, Nautical Rules, Almanack and Maps, Written and Drawn in the East Before 1515 (illustrated, reprint ed.). Asian Educational Services. p. xliii. ISBN 978-81-206-0535-0. Retrieved 14 December 2011. According to Vieira the mandarins again ordered that Pires should write a letter to the King of Portugal, which the ambassador of the ex-king of Malacca should take to Malacca, in order that his country and people might be returned to their former master; if a satisfactory reply did not come, the Portuguese ambassador would not return. A draft letter in Chinese was sent to the imprisoned Portuguese, from which they wrote three letters, for King Manuel, the Governor of India and the Captain of Malacca. These letters were delivered to the Cantonese authorities on 1 Oct. 1522. The Malay ambassador was not anxious to be the courier, nor was it easy to find another. At last a junk with fifteen Malays and fifteen Chinese sailed from Canton on 31 May 1523 and reached Pattani. ^ Tomé Pires; Armando Cortesão; Francisco Rodrigues (1990). Armando Cortesão, ed. The Suma oriental of Tome Pires: an account of the East, from the Red Sea to China, written in Malacca and India in 1512-1515 ; and, The book of Francisco Rodrigues : Pilot-Major of the armada that discovered Banda and the Moluccas : rutter of a voyage in the red sea, nautical rules, almanack ... Volume 1 of The Suma Oriental of Tome Pires: An Account of the East, from the Red Sea to Japan, Written in Malacca and India in 1512-1515, and The Book of Francisco Rodrigues, Rutter of a Voyage in the Red Sea, Nautical Rules, Almanack and Maps, Written and Drawn in the East Before 1515 (illustrated, reprint ed.). Asian Educational Services. p. xlv. ISBN 978-81-206-0535-0. Retrieved 14 December 2011. both those of Canton and those of the environs, in order to give them to understand that they thought nothing of the Portuguese, so that the people might not talk about Portuguese. Thus our ships were captured through two captains not agreeing, and so all in the ships were taken, they were all killed, and their heads and private members were carried on the backs of the Portuguese in front of the Mandarin of Canton with the playing of musical instruments and rejoicing, were exhibited suspended in the streets, and were then thrown into the dunghills. ^ Imperial China – 900–1800, F.W. Mote, Pages 658, First Harvard University Press, 2003. ^ 周, 正偉. "「明史」課程大綱 - 第七講 議禮、修玄與威刑－嘉靖政局的演變" (PDF) (in Chinese). ^ NYtimes. "NYtimes." The Kingdom and the Beauty (1959). Retrieved on 2008-04-30. ^ Datamovie.xunlei. "Datamovie.xunlei Archived 24 April 2008 at the Wayback Machine." Kingdom and Beauty. Retrieved on 2008-04-30. Dardess, John W. (2012). Ming China, 1368-1644: A Concise History of a Resilient Empire. Rowman & Littlefield. ISBN 978-1-4422-0491-1. Retrieved 24 April 2014. Naquin, Susan (2000). Peking: Temples and City Life, 1400-1900. University of California Press. ISBN 978-0-520-92345-4. Retrieved 24 April 2014. Chiang Han Hua Jennifer (28 April 2007). "Crossing Culture in the Blue-and-White with Arabic or Persian inscriptions under Emperor Zhengde (r. 1506-21)" (PDF). FINE2055 Crossing Cultures: China and the Outside World Dr. Yeewan Koon Spring 2008. Archived from the original (PDF) on 21 March 2012. Retrieved 22 May 2014. O'Kane, Bernard (2012). The Civilization of the Islamic World. The Rosen Publishing Group. ISBN 978-1-4488-8509-1. Retrieved 24 April 2014. Levenson, Jay A.; National Gallery of Art (U.S.) (1991). Circa 1492: Art in the Age of Exploration. Yale University Press. ISBN 978-0-300-05167-4. Retrieved 24 April 2014. "Lot 37 A RARE BLUE AND WHITE SCREEN Zhengde six-character mark and of the period". Bonhams. 8 Nov 2012. Retrieved 24 April 2014. Oriental Blue and White, London, 1970, p. 29. Garner, Sir Harry M. (1970). Oriental Blue and White. The Faber monographs on pottery and porcelain (3rd ed.). London: Faber. Britannica Educational Publishing (2010). Kuiper, Kathleen, ed. The Culture of China. Britannica Educational Publishing. ISBN 978-1-61530-183-6. Retrieved 24 April 2014. Valenstein, Suzanne G. (1988). Metropolitan Museum of Art (New York, N.Y.), ed. A Handbook of Chinese Ceramics (illustrated, revised ed.). Metropolitan Museum of Art. ISBN 978-0-8109-1170-3. Retrieved 24 April 2014.
ter Haar, B. J. (2006). Telling Stories: Witchcraft And Scapegoating in Chinese History. Volume 71 of Sinica Leidensia (illustrated ed.). BRILL. ISBN 978-90-04-14844-4. Retrieved 24 April 2014. Kitagawa, Joseph Mitsuo, ed. (2002). The Religious Traditions of Asia: Religion, History, and Culture (illustrated, reprint ed.). Psychology Press. ISBN 978-0-7007-1762-0. Retrieved 24 April 2014. Spence, Jonathan D.; Wills, Jr., John E., eds. (1979). From Ming to Ch'ing: Conquest, Region, and Continuity in Seventeenth-century China (illustrated, revised ed.). Yale University Press. ISBN 978-0-300-02672-6. Retrieved 24 April 2014. Perdue, Peter C (2009). China Marches West: The Qing Conquest of Central Eurasia. Harvard University Press. ISBN 978-0-674-04202-5. Retrieved 24 April 2014. Mote, Frederick W. (2003). Imperial China 900-1800 (illustrated ed.). Harvard University Press. ISBN 978-0-674-01212-7. Retrieved 24 April 2014. Association for Asian Studies. Ming Biographical History Project Committee (1976). Association for Asian Studies. Ming Biographical History Project Committee; Goodrich, Luther Carrington; 房, 兆楹, eds. Dictionary of Ming Biography, 1368-1644, Volume 1. Volume 1 of Dictionary of Ming Biography 1368-1644: The Ming Biographical History Project of the Association for Asian Studies (illustrated ed.). Columbia University Press. ISBN 978-0-231-03801-0. Retrieved 24 April 2014. Toh, Hoong Teik (2000). Shaykh ʹÂlam: The Emperor of Early Sixteenth-century China (PDF). Department of Asian and Middle Eastern Studies, University of Pennsylvania. ISSN 2157-9679. Retrieved 24 April 2014. Toh, Hoong Teik (October 2000). Mair, Victor H., ed. "Shaykh ʹÂlam: The Emperor of Early Sixteenth-century China" (PDF). Sino-Platonic Papers (Number 110): 1–20. ISSN 2157-9687. Retrieved 24 May 2014. 黃, 鴻釗. "澳門海洋文化的若干問題" (PDF): 164–169. Archived from the original (PDF) on 2 February 2014. Retrieved 24 May 2014. Wikimedia Commons has media related to Zhengde Emperor. This page was last edited on 26 March 2019, at 02:34 (UTC).